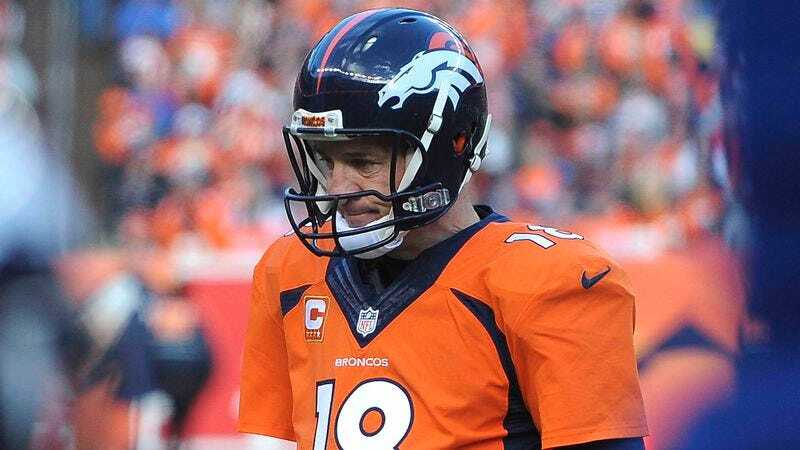 DENVER—After a lackluster performance in his team’s playoff loss to the Indianapolis Colts, reports emerged Wednesday that Denver Broncos quarterback Peyton Manning played the entire 2014 season with a 38-year-old body. “Many had suspected something was wrong as Manning’s numbers dipped during the second half of the season, but he was able to hide the precise nature of his 38-year-old body from coaches, teammates, and the media,” said ESPN’s Adam Schefter, adding that the team’s midseason shift to a more run-heavy offense was made in an effort to keep the 14-time Pro Bowler from further aggravating his nearly-four-decades-old bones, tendons, and musculature. “Manning was often seen grimacing on the sidelines and was visibly frustrated at being hampered by a 38-year-old body during games. But the situation unfortunately only worsened as he tried to play through it.” Reached for comment, sources from the Broncos medical staff expressed pessimism over Manning’s future, warning that he will put himself at significant risk if he opts to play next season with a 39-year-old body.